(Newser) – It's too late for him to attend the Grammys, where he was nominated for two awards, but lawyers for Atlanta-based rapper 21 Savage say they have secured his release from immigration custody. The 26-year-old, whose real name is She'yaa Bin Abraham-Joseph, was arrested Feb. 3 and many fans were surprised to discover that he is a British citizen whose US visa expired in 2006. 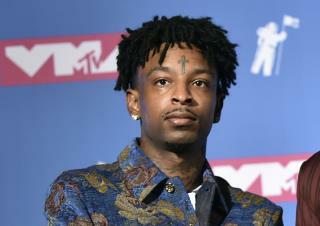 Law firm Kuck Baxter Immigration said in a Facebook post Tuesday a judge granted 21 Savage a release on bond and he would be freed from immigration detention Wednesday, the New York Times reports. Lawyer Dina LaPolt says her client was 12 when he was "left without legal status through no fault of his own" after his family overstayed their visa. he has got to be deported because of his crimes here in the USA. You cannot come to host countries and create crimes and expect to stay. Deportation is a must and he got to go and never return!!!! How would this country survive if we lost one forgettable Limey rapper?